A Conversation With…AJ Porifino of Van Ryder Games-UPDATED! Tom: So AJ welcome. What would you like to tell us about yourself? Tom: That’s a pretty impressive list. Two young boys must surely keep you busy. How in the world did you have time to start-up a game company? AJ: I recently got back into board gaming and joined a fantastic board game group which rekindled my spirit for the subject. The timing was such that another business venture was ending and I thought to myself, I am pretty creative, I bet I could make a fun game or two. So I just started researching everything I could on board game design, publishing, etc. etc. Tom: Ok, give us the run down on Organized Chaos. AJ: Van Ryder Games first release! Where do I begin? Well, I like to call Organized Chaos (OC) a “deck destroying” game. (If that term ever becomes as common place as “deck building” I will be a happy man haha). Anyway, the game is a casual but strategic game for 2-4 players. 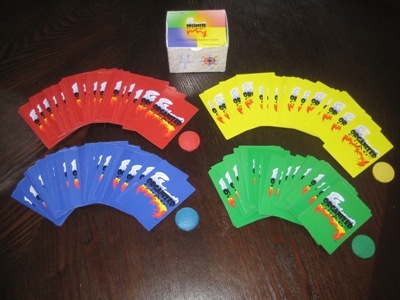 Each player starts with a deck of 40 cards which all have the same makeup. The object of the game is to be the last one to have any cards left in your draw pile. 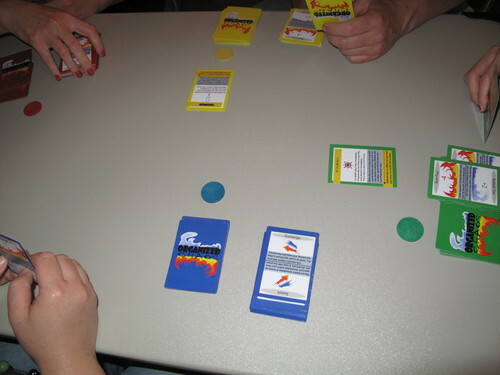 The game makes use of dual sided cards so that you have to decide on which side of the card you will use when you play it. Typically, one side of the card will have an offensive ability – something that makes your opponents lose cards, and the other side will have a defensive ability, something that lets you preserve or protect your own cards. For example one of the most common card types is “Burn/Refresh.” If you played a “Burn” card you would choose an opponent and that opponent would flip the number of card specified straight from their draw pile into their discard pile with no effect. You would hear something like “Tom, burn 5.” The other side of the card “Refresh” allows you to take the specified number of cards from your discard pile and place them back underneath your draw pile in any order. How you decide to order the cards could come back into play sooner or later. There are other special cards that can really cause havoc and change the game. For example, there is a card that let’s you Switch your entire deck including cards in hand with another player. People always ask ‘well can’t you just gang up on one player?’ The answer is yes, but that can quickly backfire with one ‘Switch.’ There are other cards as well that add levels of strategy to the game. For example, and this is my personal favorite, Reset/Restart gives you the choice to either: “Place your entire discard pile back underneath your draw pile (Restart)” or “Force an opponent to permanently remove their entire discard pile from the game (Reset)” Reset/Restart is an amazingly powerful card and there are all sorts of strategies of not only how to play it, but also how to get it back into your hand. One thing I might not have made clear yet is that there are many ways to get cards from your discard pile back into your hand. This makes Reset a strong option especially if an opponent has a good volume of cards in their discard pile or a number of strong cards. The value of Restart is a bit more obvious, if you are low on cards and have a bunch in your discard pile, well you can play Restart to essentially bring your deck back to full. 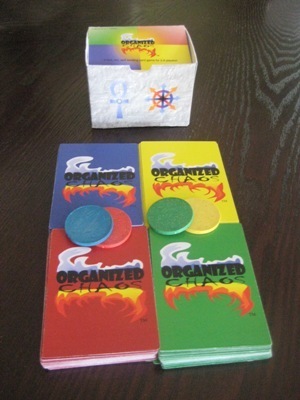 Each deck has one “Organized” card and one “Chaos” card. These are the only cards that remain in play and you are forced to play them immediately upon drawing one. Separately they have different individual abilities, but together they form the most powerful combination in the game allowing you to win if you run out of cards (this would normally make you lose) and giving you immunity against “Switch.” The catch is only one of each card may be in play at anytime. So your opponents must alter their strategy to try to get one of their copies in play, forcing you to discard yours. The last thing worth mentioning that I really love about the game is that it can have a very intriguing meta-game. It really gets interesting when players start to try to convince others what they should do, who they should go after, or not go after etc. It is all part of the game and if you can verbally manipulate others, more power to you. OC is a really fun game and one of the things I still find myself amazes at is the frequency at which the game literally comes down to the last card. You are really never out of the game until your last card is gone. Tom: I can feel your enthusiasm for OC. You’ve put a lot of time into it. I can see from your description how the Chaos part came in. ‘Deck destroying game’ – interesting. I’ve not come across that before. How much did the game change from inception to production? AJ: You know I tell people this and they think I am not giving myself enough credit, but I really think I got quite luck with how the game works. I honestly did not make a ton of major changes. I tried to find the holes in the game and plug them. The biggest change was after the very first play test. I originally had it so that you were trying to burn your own cards and be the first one to run out of cards. It was a total bust and did not work at all. Once I changed it to preserving your own cards and burning everyone else’s it worked much better. Another change I made, was adding card abilities to prevent someone from simply holding a Switch card the entire game as insurance if they got low. Redirect – your typical bounce back and Replace – Forces all opponents to discard their hand, work perfectly to accomplish that end. Other than that it was making sure the right mix of Burn/Refresh and special cards was there. I knew the Burn numbers had to be higher on average than the Refresh numbers otherwise the game could go on forever or at least a very long time. Tom: I listen to a lot of gaming podcasts. That’s how I find out about many of my guests. How important have podcasts and/or BGG been to Van Ryder? AJ: These marketing channels are very important to Van Ryder. I have supplied a lot of information on BGG and a few other websites. The game is very new (and the company for that matter), so we are doing all we can in the available time we have to get the word out and get exposure for our games. A good friend was kind enough to take OC to Balticon and demo the game. 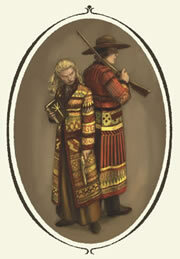 It also could be making an appearance at a smaller con in Austin,Texas in August. So far OC has not been discussed on any podcasts that I am aware of, but I am excited at the prospect of a review by Chris aka DiceHateMe on his website dicehateme.com and/or his podcast. Chris has been very supportive and I really admire his and Monkey’s approach and willingness to help out others in the industry. Tom: Chris and Monkey are friends and we game together as much as possible. They have a fantastic podcast. From the video (link below) I see that this is a pretty substantial game. Four decks of cards, tokens. What problems, if any, have you had with production? AJ: No major ones. Currently, we use The Game Crafter to print the games. We then repackage in a tuck box and ship them ourselves. What few printing issues we have had have been quickly corrected by the fine staff at TGC. Ultimately, we’d love get to a point where we feel there is enough demand for a 500-1000 copy print run of the game. Tom: So here come the standard questions. What do you think is the hardest part of designing a game? AJ: Honestly, for me it is balancing the time I spend on it. I am so heavily engrossed in this now that I easily spend full nights working on my designs. I work tirelessly and harder than you could imagine to create great and unique games. I have had to recognize when a break is needed not just for myself, but for making time for my family as well. Tom: How do you handle play testing a game? AJ: I tend to play test in my head constantly. I am pretty good at thinking about the possible situations and how things will be affected. For example, when OC was play tested the core rules and mechanics held up very well through the first round of play testing. So much so, that (to my astonishment) only handful of minor tweaks were needed from then through final play testing (again I chalk this up mostly to luck). Our upcoming title “If I’m Going Down…” (more on this in a minute) has a solitaire option so I have been able to test that part on my own quite a bit. AJ: For me it is the freedom. You are only really limited by your imagination. I love that I can create something, anything, put a theme and a set of rules to it and create a source of entertainment. Tom: I’m interested in learning what gamers think makes a good player. What do you think? AJ: To me, a good player is someone who is patient, does not take game events personally, but still has a desire to win. I am the kind of guy that will try anything once. You never can tell about something until you have at least tried it. And I am all for being competitive, but in my opinion it is senseless to get angry over a board game. I was surprised after one play test session to hear OC described as “cutthroat” because to me the actions of the game are not malicious. I have heard the cutthroat comment a few times since and now understand why some folks think that, but the way I look at things I just didn’t see it as such from my own reference point. Tom: There are SO many games out now. So many different mechanics, themes, etc. In your opinion, what do it take to make a game good? AJ: Above all else what makes a great game is that it is fun! Well maybe I should say that it invokes emotion from the players. If a game makes you laugh out loud that is a great emotion and I’d say the game did its job. If it scares the crap out of you, keeps you on the edge of your seat in suspense, or makes you not want to quit until you’ve “got it”, it is a good game. Balance is also a key. I love both simple and complicated games, but it is a major buzz kill to me when a game is “broken” mechanically. In a recent session of a game it seemed our team did everything right only to face an impossible task at the end of the game due to circumstance. As much fun as I had playing the game it stunk that the end came down to that. Finally, I like rules and events in games to somewhat realistically mirror what might happen (relatively speaking). It is a quality that I think really shows that the designer thought about what is realistic and what isn’t. The example popping in my head is the backpack in D&D. I don’t know about you, but back when I played it was amazing how many weapons, items, and gold pieces my backpack could hold. In fairness, the trump card is fun. I would rather have an unrealistic mechanic or rule and it be fun than a realistic one that isn’t or breaks the game. A good example of this is hit points or life points found in many games. A lot of games wouldn’t be nearly as fun if a gunshot, for example, killed you right away. Tom: With so many games out there, whose work in the industry do you admire the most? AJ: I greatly admire the big name publishers that kick out so many excellent games each year. But even more than that I admire the independent designers out there and the small time publishers trying to make a name for themselves. I admire the crowd funding sites like Kickstarter that are evening out the playing field between the two by giving gamers the power to choose what games they want to see come to life. Tom: Kickstarter is indeed a game changer, pardon the pun. I see good and bad potential for it. 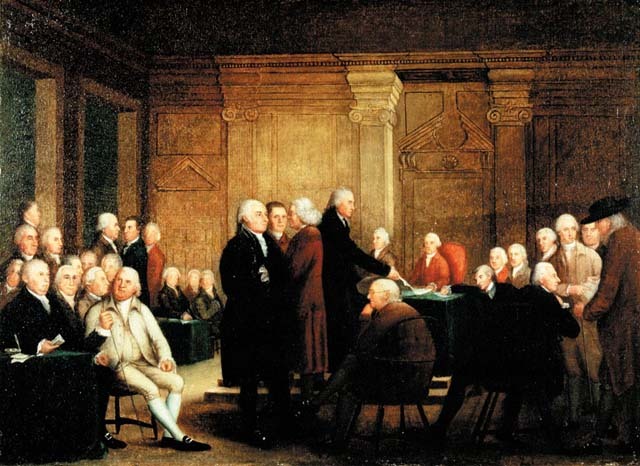 What do you think of crowd funding efforts like Kickstarter and Springboard? Boon or bane for the game industry? AJ: Absolutely, unequivocally think that crowd funding is nothing but positive for the industry. In fact, our upcoming title “If I’m Going Down…” will be showing up on Kickstarter sometime in the next few months. You can sign up to be notified of the launch on the Van Ryder website. Now that the plug is out of the way 😉 No in all seriousness, I think that crowd funding allows creative folks that would not traditionally have the resources to produce a game. It is amazing and I follow the offerings on KickStarter daily. This gives the gaming community, the players, more power than they have ever had before to choose what games they’d like to see before they are ever produced! It is really amazing. And for the independent designers out there, it evens the playing field a bit. Just great! I look forward to seeing, backing, and pimping more games on KickStarter and Springboard in the future! Tom: What makes your current games unique? What makes it stand out? 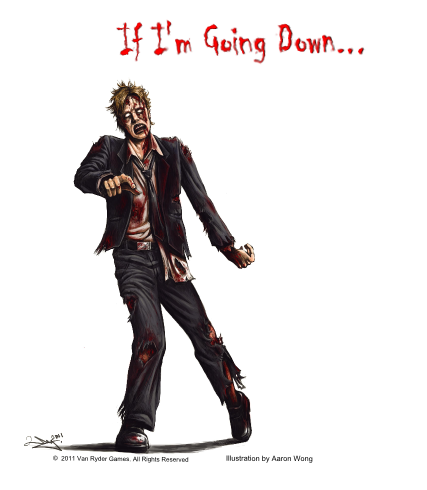 Without giving too much away about “If I’m Going Down…”, it is clearly unique in that it is the only zombie card game that I am aware of where surviving is not the goal. In fact, it is a Dying Card Game (TM) so your character(s) ARE going to die! It is a certainty. There are quite a few other things about the game that I believe make it unique, but I’m not quite ready to share that at this point. Keep an eye out for this game, you are going to love it. Tom: I agree with you about Kickstarter will absolutely allow some very good games to see the light of day. I was listening to The State of Games podcast about Kickstarter and was reminded of what Michael Mindes of Tasty Minstrel Games has said about Kickstarter. To paraphrase he said ‘the cream will rise’ and I really agree. Your description of OC’s unique aspects is interesting. The fact that you are in the game until the very end is a great aspect. And IIGD is fun. What are you currently playing? AJ: Anything I can get my hands on! I am playing (play testing really) a LOT of “If I’m Going Down…” (more on this coming, I promise ), Trade Fleet a simple but brilliant little resource card game by independent IcePack Games, Forbidden Island, Last Night on Earth, and Small World to name a few. I just want that list to get a lot bigger. I love playing games! Tom: Tell us about your other projects. Anything in the pipeline you’d like to talk about? AJ: Oh yes! Ok so I have been referring to “If I’m Going Down…” (IIGD) in some previous answers. Let me tell you about this game which I am really passionate about. I believe IIGD has the potential to be the best Zombie game on the market! We are currently planning to launch a KickStarter campaign to help fund the game once it nears completion. IIGD is the very first Dying Card Game™ or DCG, which is a game in which your character(s) WILL die by the end of the game. Most if not all zombie games in pretty much any genre are about surviving. That is your character’s goal too, but what you know that your character does not, is that their situation (like in many zombie infested worlds) has become hopeless. The goal has changed from surviving to taking down as many as the abominations as possible. IIGD has a tower defense like mechanic where your character is stationary and the zombies just keep coming. You can search for and find weapons and resources that will help you dispose of the vile things, but eventually, if you are lucky enough to survive that long, the resources will run out. In the end, it is about how many zombies were you able to kill and were you able to complete any other actions that gave you bonus points. I am also toying with some other ideas that add another layer into the game as far as your objective goes. One of the things that makes IIGD different than any other zombie game is that the zombie illustrations have character and detail that you won’t find elsewhere. This is one reason why I decided to use cards even though you might think it makes more since to use miniatures. I want players to see the zombie card and wonder, ‘what was her story?’ ‘What happened to him?’ ‘I wonder how the zombies finally got them?’ I can promise you that you will be amazed at the zombie art in this game. The last thing I would say about IIGD is that it will be created to give some level of creative control to the player(s). You can develop your own scenarios to play. We also have another game in the works called “Componegotiate™” which is an interesting game where each player is trying to collect a different set of components. While there are general ways to acquire the components, the game will have an important negotiating aspect to it that gives the best negotiator (or perhaps the worst depending on your viewpoint) the best chance to win. The other games are too far away to mention at this point but I promise you I have some other great ideas in my head. Tom: I’m happy to see that there are more games on the way from Van Ryder. Are there any links or sites you want to direct us to? Find our games at Game Crafter as well. www.thegamecrafter.com. Thanks a bunch for talking to me A.J. And Componegotiate™ sounds fun. Please stay in touch. Well guys and gals that’s it for another Go Forth And Game interview. Leave a comment below. Please visit Van Ryder Games, check out their games. Dogs In The Vineyard - one of the classic indie games. I’m having some friends over to play role playing games today. The theme today is independently published games. Lined up for play – Spirit of The Century, Icons, The Shab Al-Hiri Roach, Counting To Infinity, Spirit of The Shattered Earth, maybe Dread, Fiasco, and…Dogs In The Vineyard. I’ll report back on how it went in a couple of days. They're really playing Spirit of The Revolution.